Ava Messinger was only 7 when she first sang on stage. She played the role of Molly, one of the featured orphans in Driftwood Players' production of Annie. But while Messinger remembers being scared and nervous, it's the excitement and magic of being in a show that stuck with her. "It was actually double-cast: there were two Annies and two Mollys. My Annie was really nice, and every day at rehearsal, she greeted me with a hug," Messinger said. "Since I was only 7, she was like a giant to me!" Since that first show, Messinger, now a 12-year-old 6th-grader at Terrace Park elementary in Edmonds, has numerous credits on her theater resume, including Hello, Dolly; Joseph and the Amazing Technicolor Dreamcoat; singing with Seattle Girls' Choir. As a member of Seattle Opera's Youth Opera Chorus, she's also sung on the McCaw Hall stage, performing in such productions as La bohème, the Ring and Tosca. "One of the biggest differences between opera and musical theater is that in opera, it's just so much bigger. Even if you don't have a huge role, it's still amazing to hear all of those voices around you. It's very loud, of course!" Messinger became interested in opera in 2012 after she participated in a one-week camp led by Barbara Lynne Jamison (recently appointed Seattle Opera's new Director of Education & Community Engagement; formerly the company's Youth Programs Manager). Getting to sing with the older girls in a camp for youth in fourth grade through high school made a big impression on both Ava, as well as her parents. "We were thrilled to find this camp for our daughter, and impressed with everything about the way it was run, as well as with the quality of the final performance," said Mike Messinger, Ava's dad. "My daughter found her niche with other great, accepting and passionate kids." 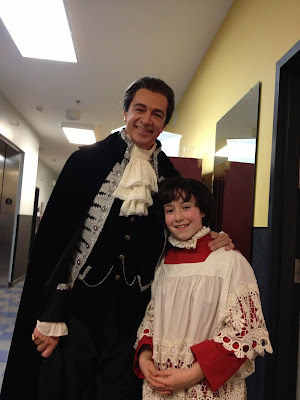 Greer Grimsley (Scarpia) and Ava (playing the role of a choir child) backstage at McCaw Hall for Seattle Opera's January 2015 production of Puccini's Tosca. Next summer, Ava participated in a two-week camp at Seattle Opera. These experiences led to her involvement in the Youth Opera Chorus and performing in several mainstage performances including Tosca last January. "I really like Scarpia (the villain character in Tosca)," she said. "He’s amazing." Unlike her first camp experiences at Seattle Opera, in Tosca, Ava was the older, more experienced chorister. It was cool getting to watch her less-experienced peers grow in confidence throughout the rehearsal process and performances. By the end of the show, they had all become good friends. Operas are a blast to be in, and they're also fun to watch, according to Ava. "Sure, we have our really long arias, like when Sigmund meets Brünnhilde (in Wagner's Ring) and it seems like it's two hours long! But most of the time, opera is really interesting, kind of like reading a good book." Ava during a costume fitting for her character as an "Urchin" in La bohème (2013). Mike said watching Ava blossom through the arts has been fascinating and rewarding to watch, from her first performance in Annie ("That was my proudest parental moment!") to now, where the 6th-grader also reads music and is passionate about learning and practicing music. Even though Ava wants to be a lawyer rather than a performer, these experiences are invaluable, Mike says. The young singer and aspiring lawyer agrees. "In a way, being a lawyer is kind of like performing," Ava said. "You have to understand people's motivations and desires. You have to persevere and use good communication skills. I think what I've done through singing will help me move toward that." For more information about Youth Opera Chorus and opera camps for summer, click here. Ava backstage with buddies, her fellow "Nibelungs," in Das Rheingold (2013).